I am home safe and sound after four exciting days of swimming in Mesa with 1817 other swimmers from all over the country. Among us were Olympians (including Gold medalist, Rowdy Gaines), USA National team members, and people like myself out there swimming to stay healthy. Over the course of the meet, I swam five personal best times, proving to myself that I am only getting better with age. I placed 6th in my age group in 50 breast, 8th in 200 breast, and 9th in 100 breast. I also met some amazing swimmers who were there to give their all, despite coping with cancer, cystic fibrosis, heart failure, and other severe and/or chronic illnesses. These people remind me what a wonderful gift it is just to be alive and serve as inspiration to help me keep my chin up when I face what is really nothing more than a petty difficulty or two compared to what these people face. When a competition goes well, I like to analyze what went right so I can replicate the conditions again the next time. Hopefully you can glean something from my analysis and use it to your advantage in your next race. 2 – I got lots of sleep before and during the event. 8 or 9 hours a night… Stretching before bed helped me relax so I could go instantly asleep. 3 – I hot tubbed and stretched every night so I never experienced any muscle soreness. I also did a very long cool down (400 to 500 yards) right after my last race. 4 – I avoided static stretches pre-race, which have been proven to reduce power to muscles for a period of time afterward. I did “shake” the muscles to keep them super loose. 5 – I stayed away from the pool as much as possible when I wasn’t racing. I found the 1800 people plus family and friends mob scene very over-stimulating and needed to have time away from this chaotic scene. Some swimmers around my age are also very exclusive of people outside their clique and I prefer to stay away from those people as much as possible. 6 – I stayed covered so I didn’t get cold or lose energy from the sun. 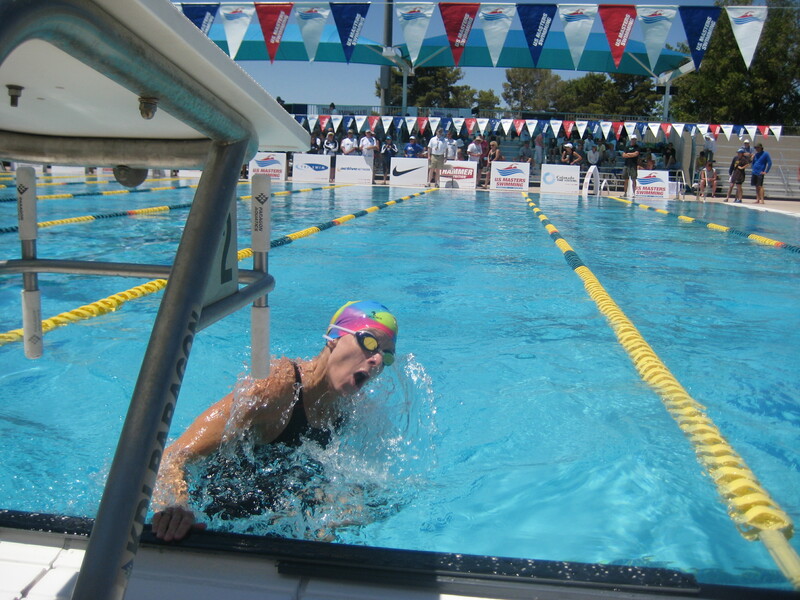 7 – I made sure to do some fast swimming during warm-up. I watch my times, so I’m sure I’m really warmed up. It takes longer to warm up a 48 year old body, so I need to spend more time in the warm-up pool than I used to. 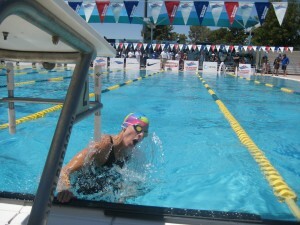 8- I got back in the warm-up pool very close to my sprint events so that I was “keyed up and ready” to swim super fast. There is nothing worse than doing a sprint and not feeling fast until the race is almost over! 9 – I swam my own races. This may not work well for everyone, but I find that if I am too concerned with what other swimmers are doing, I forget what I am doing or allow myself to get psyched out. In Masters swimming, you often don’t know what kind of times swimmers are capable of doing. Some people put in very slow entry times, whereas I always put down my best times in nationals. If a swimmer who has put in a slow seed time is suddenly way ahead of me, it is easy to start freaking out and convincing myself I’m swimming a disastrous race. I try to focus on my own race so I don’t swim a poor race needlessly. I always have a plan for what I want to do and I try to stick with it first and foremost and go by how I feel instead of by what is happening around me. Within the boundaries of swimming my own race, I compete with others. 1 – This was the first nationals I attended where I actually did not enjoy myself at all. It was very crowded there, I had some personal issues going on and so I never felt relaxed. I didn’t laugh and joke with people like I usually do either. I hated the hotel where I was staying and kept wishing I was at home all weekend. I feel like I would have swum even better had I felt a little light-hearted. I hope some of you will share your thoughts on competition and what works and doesn’t work for you!! Thanks, Cheryl. I’m glad you enjoyed the article on swimming vacations. I got so excited while doing the research, my husband and I are planning on doing one in Vanuatu early next year! Would love to talk to you and the lady you interviewed so that we will know what’s in store! Jen isn’t going until July and my husband and I are considering January or February 2012. If you want to email me later this summer, I can connect you with Jen. My email is susan@corazondeloro.com. When are you planning to go? Not until summer of 12 or even 13….so we have plenty of time for you guys to do your thing and for us to connect! Thanks! It was great meeting you at Nationals! And, I enjoyed reading your piece on the upcoming LCM Nationals, at Auburn. This is my first visit to your website- and it rocks (no pun intended)! I especially appreciated your recap of your Nationals experience. As a fairly new Masters swimmer who trains on my own, the warm-up pools are claustrophobic and hectic for me, at Nationals. I am so used to having my own lane, as well as a mostly-empty pool to swim in each day! I appreciated you letting your readers in on your race prep secrets. Now that I think about it, I warmed up too soon at my last couple of meets, allowing too much time to go by before my race. That will change at my next meet! Thanks! I’ll look forward to seeing you at Auburn! I’m glad you are gleaning something from the blog. If there are any particular topics of interest, please let me know – I’m always open to suggestions. It is very hard to find the right balance between having enough rest after the warm-up and not too much so that you feel flat during the race. I kept wanting to avoid the warm-up pool also because my face hurt from wind burn and the warm-up pool was so crowded, but particularly for sprints I have to be in the water within a few minutes of the race. I think Auburn will be better – they have more water available for us!